A recent poll by the BBC, based on submissions from 82 book critics from countries other than the UK, generated a list of the greatest British novels. Notwithstanding the possible flaws in the sampling and polling methods (which seemed to resemble those deployed for the Eurovision Song Contest), the results were fascinating. Middlemarch was the book which grabbed the headlines as the greatest British novel, but the results of the poll gave rise to farther-reaching discussions. Six of the top ten titles were written by women – so does that mean women are ‘greater’ writers than men (particularly given that they often had to battle against discrimination in their day)? The highest entry from recent years (and there were only thirteen novels from our own century in the list of 228 titles) was Ian McEwan’s Atonement at No. 15 – does that mean that great novels are simply seldom written today? With its large catalogue of the classics, Naxos AudioBooks has, of course, produced unabridged recordings of many of the titles on the list and all of those in the top ten. Does ‘greatness’ (at least as demonstrated by this poll) translate into popularity? Well, to a large extent (and somewhat happily for us), it does. Middlemarch has been one of our most popular titles since its publication a few years ago. It is given a sublime reading by Juliet Stevenson – who also, by coincidence, read the two Virginia Woolf novels that are Nos. 2 and 3 on the BBC list. It was suggested that an important part of the novel’s strength is in the depiction of its numerous characters – which, in the audiobook world, presents a particular challenge to the reader. This applies to many novels of course. One immediately thinks of Dickens, also well represented in the poll, with his many and much-loved caricatures. But, of course, there is much more to Middlemarch than that. As important as the narrative thread is the voice with which it is told, and this is where the novel excels. There is a real sense of George Eliot herself throughout the novel, whether it be on the subject of political reform or the status of women. 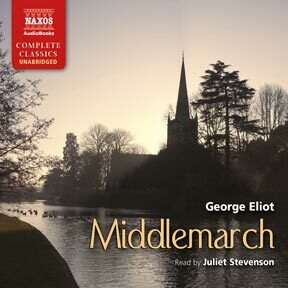 This voice has to be accurately and sympathetically reflected in an audiobook recording, and this is where Juliet Stevenson is particularly strong. There is a line in the novel spoken by the pedantic Edward Casaubon: ’I am fastidious in voices and I cannot endure listening to an imperfect reader.’ In this reading there is no chance of that!